We had a dinner party this weekend and it was great to have friends over for a relaxing evening. I decided on a traditional fall menu. We started with my Butternut Squash Soup for the first course. My Color Coded Life tip for the night before: chop the vegetables and apple and put the squash in the refrigerator to thaw. Put the bacon to the side. Drain the macaroni and set to the side. 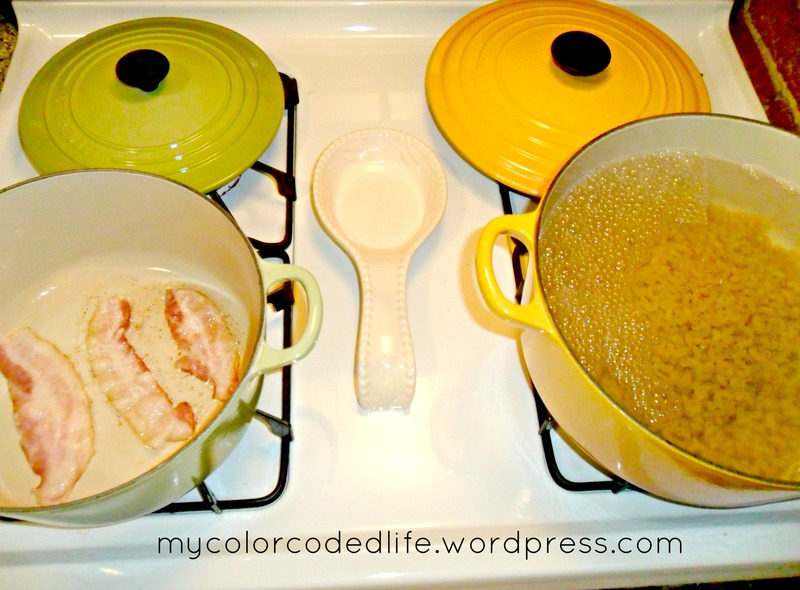 Pour half the bacon drippings into the pot you cooked the macaroni in and put to the side. Tomorrow, I’ll post that recipe! But for now back to the soup! 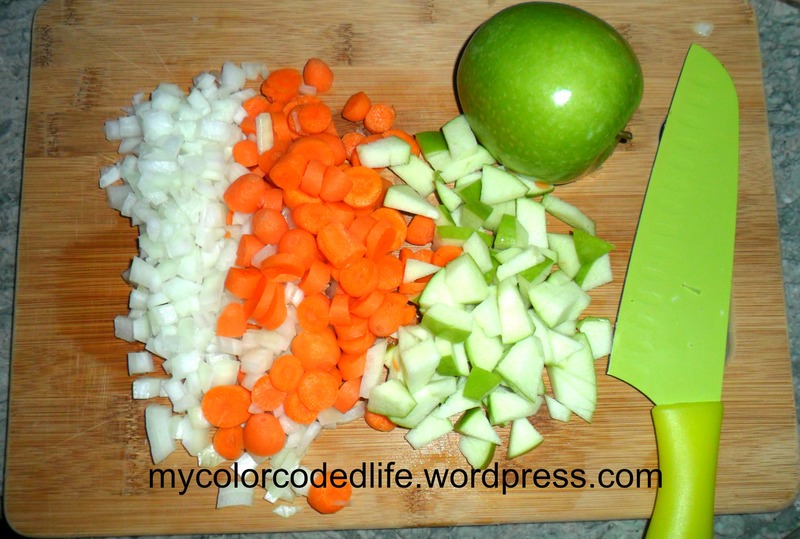 Chop up the onion, carrots, and granny smith apple. Saute the onions and carrots in the bacon drippings until the onions are tender. Add granny smith apple and garlic powder. Saute for another few minutes. Add the thawed squash and chicken broth and bring to a boil. Reduce the heat. 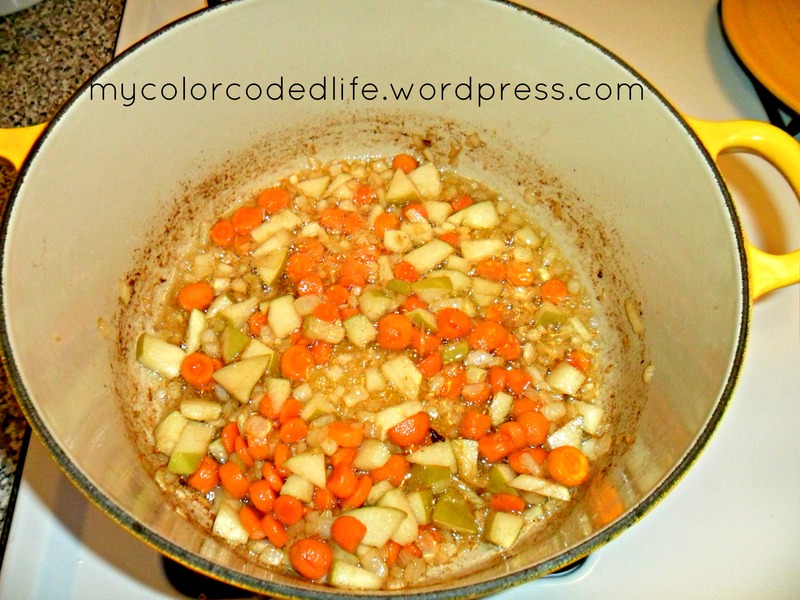 Let soup simmer for 20 minutes until carrots and apples are soft. Using a food processor, chop and then puree the soup in batches. You will need another pot or dutch oven to pour the pureed soup into. Once the soup is pureed, add lime juice, honey, salt, pepper, ground allspice, ground nutmeg, red pepper, and whipping cream. Stir completely. Keep warm until ready to serve. When serving, add a dollop of sour cream to each bowl and crumble a piece of bacon on top. And by the time I was done, guests were arriving, so I never got a “ready to serve” shot!!! Next time I make it, I’ll post one! I also served a salad during the first course. Check back tomorrow and see what I’m going to have you do with that extra pot with bacon drippings and your cooked macaroni! 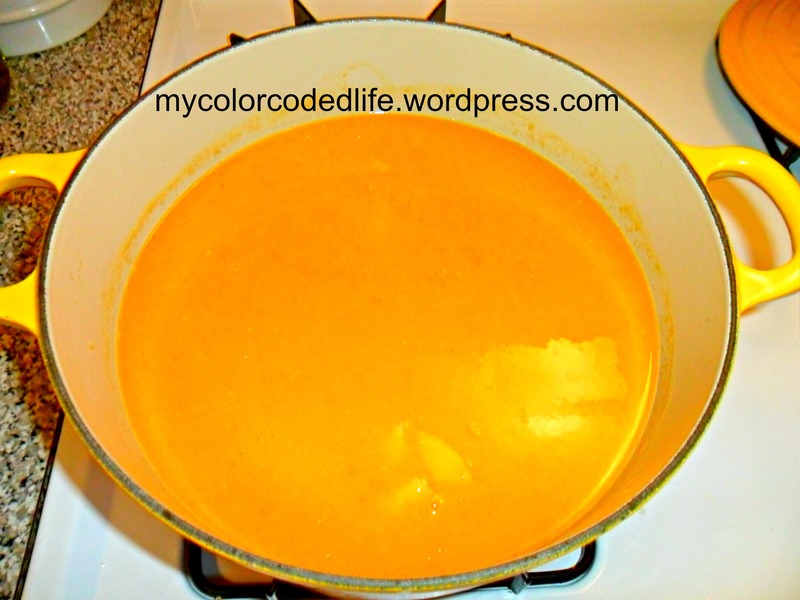 I love this soup — sometimes I double the batch and freeze some for later. So glad I now have the secret to make this myself. (I had no idea about the bacon. yum). the bacon is the secret ingredient!